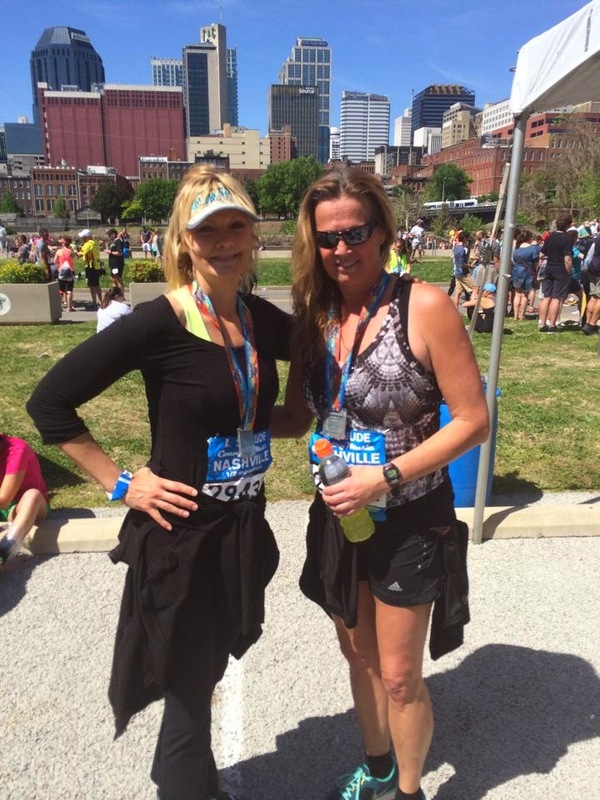 I am relieved to announce that Baby Sis and I survived the half marathon in Nashville, however our time was terrible. Given that neither one of us had trained, we're lucky to have survived it could have been much worse. Baby Sis was clearly more prepared than I, but she hung back with me the whole race. Baby Sis didn't want me to mention our actual time, since it was our worst ever. However, I told her she was looking at it all wrong. This so-called bad time also represents the longest either one of us has exercised without stopping: two hours and forty five minutes. So almost three hours of movement! Sounds better when put that way, I think. Some nights I'm lucky if I get three hours of sleep, so three hours of physical activity is pretty good! This year the weather was simply spectacular. Our friend and hostess Lauren took us to some fabulous places. The first day we drank wine hung out downtown. We drank wine had lunch at a place called Merchants. The deviled eggs were outstanding. who is also beautiful! a hockey player. Lauren lives in a resort-like apartment complex in Franklin. We spent many hours enjoying wine lounging by her pool. Did I mention the wine? to be fighting for the right to pour. Lauren's daughter Emnma joined us Sunday evening on a last-minute excursion through miles and miles of beautiful horse country to Arrington Vineyards. Guess what they serve there? We arrived just before it started raining, so we only stayed briefly. After the vineyard, we traveled back to Lauren's apartment, watched movies and enjoyed more wine and laughs in complete denial that our adventure was coming to a close. Monday morning we flew back to Virginia. Baby Sis and I would like to thank Lauren for once again providing us with a perfect getaway. We relaxed, we laughed, we frolicked up and down the streets of Nashville, we ran a half marathon, we ate lots of good food, we enjoyed lots of good wine, we met new people, we sat next to a beautiful!! quasi-celebrity named Mike Fisher, and we basked by the pool in 80-degree weather. Unlike what the sign above says, looking back on this weekend, I didn't miss a thing*, and the good time was all around me no matter where we were. p.s. There are more stories to tell about traveling with Baby Sis--such as when I confidently walked off with some very nice man's carry-on bag (he stopped me before I got too far, we had the exact same blue bag), and the time she thought the announcement over the public address system in the Richmond airport asked for Nashville passengers to please approach the counter to verify passports. In fact, they were asking international passengers to please provide passports. When I looked her dead in the eyes and confidently told her Nashville didn't require a passport, she still wanted to go up to the counter--even though she didn't have a passport and even though nobody said anything about Nashville and even though anybody in their right mind would know passports aren't needed to cross state lines. * I did miss my children a little, but I sure didn't miss cooking or cleaning or laundry or cutting grass or driving hundreds of miles to work/soccer games or ant infestations or gutters that need cleaning or ....I want to go back to Nashville now! Baby Sis and I are headed on our mini-vacation (if you call crawling jogging through the streets of Nashville in 80-degree weather a vacation--and we do). This blog will resume its regularly scheduled silliness at some point next week. I hope to have many stories to share if I survive when I return. These were taken a few weeks back just before the leaves started budding on the trees. Winter is usually the best time to catch glimpses of some of the older abandoned structures that lurk in our many wooded areas, but this winter I didn't get out nearly enough to take pictures. The poor daffodils sagging in the last few photos were only doing so because it was a cold, damp day. They perk right up as soon as the sun arrives to warm them up. I pass all of these hidden houses--and more--on my favorite jogging route in the county. That would be the very same jogging route I've visited far too infrequently this year, making me ill-prepared for anything resembling the half-marathon I'm signed up for on Saturday. Baby Sis and I will walk a part of this half-marathon if we must, in spite of our inner competitive demons which despise the thought of surrender. She claims her knees are "bone against bone" with no cartilage to speak of. I respond with statements like, "The longest I've run recently was six miles one time the other week, but my memory's so bad it might have been the other month--and I've done nothing since then except sit at a desk or in a car. And eat. I've done lots of eating." It's almost like we're in a competition to see who is the least ready. As I've said before though, we need no training to have a good time. But that's all this weekend. These next couple of days I'm off from work and will spend some time with Daughter and Son, who are on spring break. Son will be working at Merroir most of the time, but we'll squeeze in an adventure or two that includes a trip "to town" as we say, also known as a trek "across the river." Translation: We're headed to Newport News to take care of things like haircuts and errands that we otherwise never have time for. Because that's what this family seems to do best. Easter Sunday came knocking on the door before most in the Chesapeake Bay Family even knew what hit us. At some point, we agreed to have a dinner at my house. Baby Sis drove in from Richmond to spend the day with us. She livens up every event. She and I leave Friday for a trip to Nashville to see our friend Lauren. of us is prepared for. I feel confident we will achieve the main goal of having a good time. This was a recent sunrise on Queens Creek. I'm starting to feel slightly more energized now that the sunrise comes earlier and sunset is later. However, the temperature here lately feels like winter is refusing to release her clutches. Yesterday I cut grass for a few hours in a heavy sweatshirt and nearly froze to death. My fingers were numb for quite a while afterwards. It's just way too cold for April. There needs to be a law against having to cut grass in a sweatshirt. Grass cutting is a shorts and tank top chore. The grass shouldn't even be able to grow in this cold weather. But it sure is. Under the category of It's a Small World, during the walking tour of the dorms at UVA, the guide asked Son where he was from. 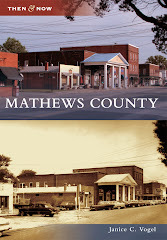 When he replied Mathews, a woman said, "Oh, I have a friend with a house in Mathews. Do you know Blah Blah Blah? She lives on Queens Creek." When she learned I also live on Queens Creek, she became my best friend--at least for the duration of the walk to the dorms. In other news, Mathews schools are out for spring break next week. Son is going out of town, so it will be just me, Daughter, my parents and hopefully Baby Sis for Easter dinner that I volunteered to fix. Have a great weekend and to those who celebrate it, Happy Easter. These were taken a week or so ago from Williams Wharf. It was one of those rare calm mornings when there wasn't even a ripple on the East River. This old railway is so photogenic. I parked here this particular morning to go for a jog. Williams Wharf Road is exactly a mile from end to end, so it's easy to keep track of your distance. Speaking of distance, Baby Sis and I are scheduled to run 13.1 miles in Nashville a week from Saturday. I can tell you that I've never been less prepared for a half marathon in my life, but that's OK. If I have to walk, I'll walk. Click here for more information on Williams Wharf, which is also the home of the Mathews High School crew teams. This weekend, upon returning home from a fabulous getaway with some high school friends, I was relieved to see the daffodil fields were still in bloom, untouched by the impending doom tilling that will soon take place to prepare the soil for farming. At dinner last night Daughter told me that she and her friend Olivia spent most of the day Saturday picking flowers and delivering them to friends and family. I'm so grateful they were able to share these cheerful flowers with others. Speaking of cheer, my weekend away with friends was outstanding, just what the doctor ordered. There was an overabundance of sunshine, laughter and the scent of ocean air. It was just the sort of rejuvenation my stressed-out soul needed. This week, in addition to the usual running around for work and Daughter's soccer, I will travel with Son to Charlottesville for a Visit UVA Day, filled with activities intended to sway a potential student to accept their offer of admission and introduce them to daily life on grounds. Even if I feel like just yesterday I was the one trotting off to college instead of bearing down hard on the age of 50.